Born in 1921 in Montreal, Jack Nichols was largely self-taught as an artist. In the fall of 1942 he served as a deckhand on a Great Lakes freighter. His combination of skills led to a 1943 commission from the National Gallery of Canada to depict the activities of the Canadian Merchant Navy. In February 1944 he was enrolled as a sub-lieutenant in the Royal Canadian Naval Volunteer Reserve, and was appointed an official Canadian war artist in April 1944 with the rank of lieutenant. Nichols was present at the D-Day landings in Normandy in June 1944, later sketched on a number of warships, and was on board HMCS Iroquois during the attempted evacuation of Brest by the Germans in August 1944. (Men on H.M.C.S. Iroquois at Action Stations/10516) Nichols was released from the navy in October 1946. Nichols's drawings form the bulk of his official war art. Only eight compositions were worked up in oil and they are unique within the Canadian War Records Collection because of their emphasis on the human experience in war time. Acutely sensitive to his subjects' feelings and reactions, Nichols in his drawings (and paintings) does not shy away from the ever-present spectre of death, a quality underlined by the blackness of the medium in many cases. Ammunition Passer, for example, refers to Christ's carrying of the Cross en route to His own death, while the blank eyes in Troops Moving Forward are as lifeless as sculpture. 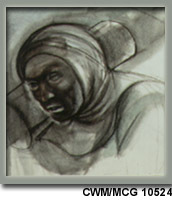 The drawings emphasize the figure and face, whose gestures and expressions are often exaggerated.